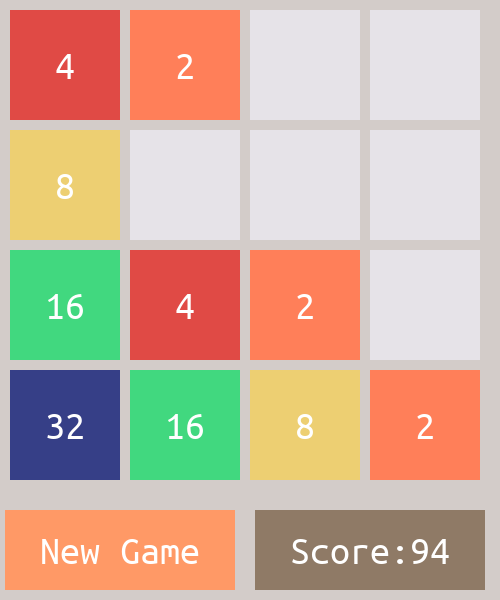 This is my implementation of the classic game "2048" in C. The instruction to build/run the project (GitHub repo) can be found here. I started with the core game and then built a GUI interface out of it. I would love some feedback on my design. How the same implementation can be better written. Idioms, conventions, anything that comes to your mind. There is some information about the functions in the header files. Hope that improves readability and understanding. I create the texture for the text 2,4,8.. every time I draw the tiles. This is wasting resource since I can simply create the 16 tiles once and never have to worry about it again. There might be some brace inconsistency between Java and C style since my IDE doesn't do this automatically. Am I leaking memory anywhere? techniques to make my code more versatile/generic. Using matrix structs, as suggested by one of the answers, would help to create rectangular boards. Edit: The repo is updated constantly. Please use the link above to see the version of repo when this question was posted. I wouldn't mind comments on the latest version either. * @brief File containing function declarations for the game gui. * @brief Initializes the SDL window. * @param gWindow The window of the game. * @return If the initialization was successful. * @brief Closes the SDL window. * @brief Draws text centered inside a rect. * @brief Draws white text centered inside a rect. * Fills a color to entire screen. * @brief Draws black text centered inside the window. * @brief Draws the game tiles. * It draws the SIZE*SIZE game tiles to the window. * @param matrix The game matrix. * @brief Draws the new game button. * It draws the new game button to the bottom corner. * @param matrix The game matrix. Needed to reset game. * @brief Handles the action of New Game button. * @brief Draws everything for the game and renders it to screen. * and also renders it to screem. * @brief Handles keyboard presses that correspond with the arrowkeys. * It transforms the game matrix according to the keypresses. * and resets the board if game over. * @brief File containing tile colors and related structs. *  All values are stored in chars. * @brief File containing function declarations for the core game. * @brief Write the game matrix to the stream. * The matrix is written as a comma seperated list of indices. * Each row is seperated by a '\n' character. * Each empty cell is represented by '-' character. * The indices can be used to calculate the actual integers. * @param matrix The game matrix that is to be printed. * @param stream The file stream to use. * @brief Checks if there are possible moves left on the game board. * Checks for both movement and combinations of tiles. * This zeros out the entire game matrix. * @brief Adds a value of 1 to random place to the matrix. * The function adds 1 to a random place in the matrix. * The 1 is placed in empty tiles. i.e tiles containing 0. * 1 is kept since you can use raise it with BASE to get required value. * Also it keeps the size of matrix to a low value. * If no empty place is found a floating point exception will occur. * It score the matrix in a simple way. * sum of all BASE^element is returned. * @brief Shifts the game matrix in X direction. * It shifts all the elements of the game matrix in the X direction. * direction. Any other non zero value shifts it to the right direction. * @param opp The direction of the shift. * @brief Merges the elements in X direction. * It merges consecutive successive elements of the game matrix in the X direction. * direction. Any other non zero value merges it to the right direction. * @brief Moves the elements in X direction. * It simply performs shift_x() and merge_x(). * @param opp The direction of the move. * @brief Shifts the game matrix in Y direction. * It shifts all the elements of the game matrix in the Y direction. * direction. Any other non-zero value shifts it to the bottom. * @brief Merges the elements in Y direction. * It merges consecutive successive elements of the game matrix in the Y direction. * direction. Any other non zero value merges it to the bottom. * @brief Moves the elements in Y direction. * It simply performs shift_y() and merge_y(). char score; //15 chars is enough for score. //No need to null out font. //Set up the game matrix. Well done. This is not a complete review, but instead a (short) list of possible improvements I found when I skimmed your code. First of all: thank you! It's great to have documentation. Note that there is some debate whether to put the documentation into the header or the source. I'd like to remark that I would put only a @brief description in the header and a complete documentation into the source. That way, one can get a quick overview of all functions and look into the details if they found the correct one. However, that's personal preference, and in a team project you would stick to whatever guideline is already present. The generated documentation by doxygen will stay the same, either way. While it's possible to model a matrix this way, it's inflexible. The game is now stuck at a size that was chosen when it was compiled. If you want to enable other board sizes, you have to add some logic to keep the board in the matrix anyway, so a variable SIZE will be necessary. Also, interesting boards like 4x6 are downright impossible at the moment. Whether you use a single allocated malloc(sizeof(*actual_board)*SIZE*SIZE) or SIZE times malloc(sizeof(*actual_board)*SIZE) is, at least for small sizes, not important. The former is easier to handle in terms of memory, the latter is easier in terms of access. Just like documentation, this is a great feature of your code. There are no magic numbers in the code, every number is properly defined to provide some self-documentation. However, some comments on #defines are usually expected, and Doxygen should give out some warnings. There is a single magic number, though, in main. See "blindness" below. That being said, occasionally there is bool success = 1 or 0. Due to bool, it's clear that they mean true and false. You could, however, just #include <stdbool.h> and instead use the language defined boolean. There are tabs and spaces mixed in the code. It's not evident in the code here on StackExchange, but on GitHub. You probably want to fix this, as several editors use 8 spaces for tabs, not 4.
perror will show the user supplied string, as well as a textual description of the error code stored on errno. None of the SDL functions set errno as far as I know, so perror won't report the correct errors. Instead, use printf or fprintf and SDL_GetError. As hinted in the code above, when CreateWindow succeeds but CreateRenderer fails, the gWindow isn't properly destroyed. Furthermore, initSDL's caller cannot find out why the initialization failed. Enums are usually the solution in that circumstance, at least as long as we don't clean up. There was a stray semicolon. While it's not an error, it indicates that the code was previously if(!initSDL(&gWindow,&gRenderer))exit(0);, then some things got changed, and changed back. If you use braces all the time (with proper indentation), it's easier to see conditionals, so make sure to make the code as clean as possible. At least move_x and move_y can be improved that way. In computer sciences, there are two hard problems: naming, caches and off-by one errors. Here we focus on the first one. The gRenderer and gWindow have a g prefix that's not explained. None of the other variables have a prefix. If g is a common prefix for SDL objects, then it's fine, however, I guess it's for game. However, it's strange that the board itself then is prefix-free. The board is called matrix throughout the whole game. However, matrix is a term from Mathematics or a film title, but doesn't quite fit the "board" function. board on the other hand would be a perfect name. Also, the plural is a lot easier, in case you ever want to implement a variant where the player plays on two boards at the same time. The SDLclose and SDLclear took me by surprise. Both functions don't follow the usual SDL_<name> approach, because both aren't from SDL. In C++, you would put those functions into your own namespace, but in C, use a prefix that you defined. Alternatively, follow the initSDL approach and call the functions clearSDL and closeSDL. Those names are completely unambiguous. Here, *gWindow = NULL makes sense. However, as SDLclose is one of the few functions that don't have accommodating documentation, it's not clear what the intended behaviour is, so I'd stick to the former, e.g. * @brief Destroy the @a gWindow and quit SDL. * @param gWindow is the window that will be destroyed. //! @warning `gWindow` **must not** be used afterwards. Since the other reviews have already hit most points, I'll just mention a few not already covered. This makes the code less dependent on the actual file structure, and leaving such details in a single location: a Makefile or compiler configuration file. With cmake, we can use include_directories. Since you've already got that in your toplevel CMakeLists.txt, just append the include directory in that CMake directive. On most platforms, the difference between #include "math.h" and #include <math.h> is that the former looks first in the current directory. So for system files such as SDL2/SDL.h, you should really use #include <SDL2/SDL.h> instead. See this question for more details. In many cases, it's likely that either will work, but to the human reader convention is that files in your project use "" while system includes (files not in your project) use <>. That's an imprecise differentiation, but a useful way to think about it. The merge_x and merge_y functions are almost identical. I think it would make sense to combine them into a single merge function that would take a direction as an additional parameter. The same approach can be taken with the shift and move functions. The SDL interface is hard to use correctly without leaking memory, because it isn't always readily apparent which functions allocate and which functions de-allocate. In this code, initSDL creates a renderer but never calls SDL_DestroyRenderer. I'd recommend adding a pointer to the renderer as a parameter to closeSDL and making sure it's non-NULL before calling SDL_DestroyRenderer. There are a few small enhancements that would make the game better. First is to allow the user to see and savor the high score instead of immediately launching a new game. Second would be to detect whether any moves are possible rather than waiting for the user to attempt to move before evaluating this. Adding to @Zeta's excellent answer. Sometimes you put spaces around arithmetic operators, but you usually don't. Lastly, in your header you sometimes have two blank lines separating docstring-forward-declaration pairs, and sometimes you have just one. I would encourage you to use clang-format to keep your style consistent. Code like this always has bugs, even if they're just theoretical portability bugs. It's best to get out of the habit of writing it, even if it's working on your computer. Of course, you could always just use snprintf with a fixed size buffer and just truncate when things get too large. Not the answer you're looking for? Browse other questions tagged c game gui sdl 2048 or ask your own question.